The unknown variables that come with unemployment have robbed me of any desire to splurge on high-quality sushi, which is a shame really, because sushi is one of a few foods that my body and palate actually crave. There was a time in my life when a boat full of Costco manufactured California Rolls with a few packets of Kikkoman satisfied my sushi fix, but I can’t seem to stomach the stuff these days—I may be down, but I’m hardly out. 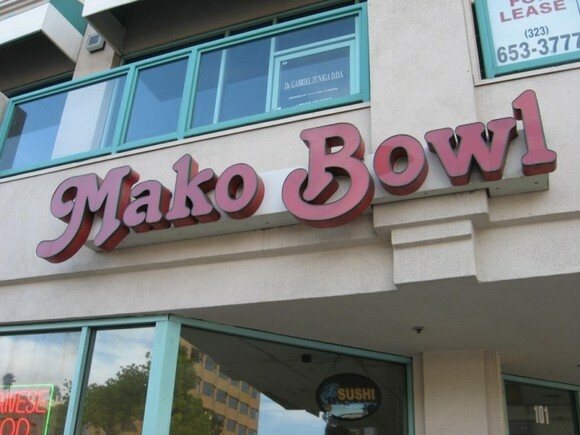 Money management tips on the search for budget-friendly sushi alternatives, I decided to give Mako Bowl a try. 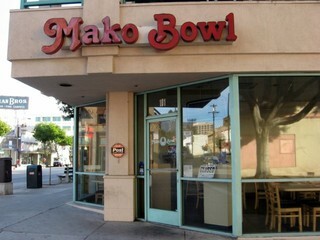 Mako Bowl is a local chain that specializes in Japanese food served in plastic bowls. The bill of fare includes Teriyaki chicken bowls, tempura bowls, udon noodles, edamame and a plethora of other Japanese and Japanese-American fare. 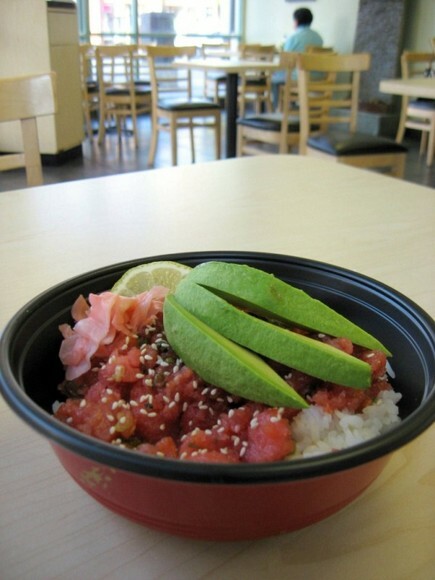 On my visit, I went with a Spicy Tuna Bowl with avocado ($8.25). 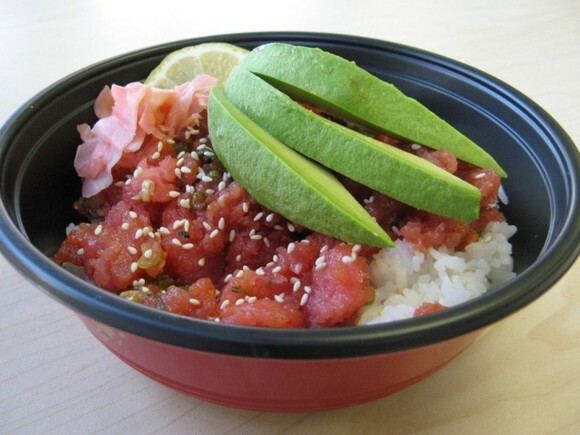 The Spicy Tuna Bowl consisted of a good-sized portion of warm and vinegary sushi rice topped with mushy spicy tuna, sesame seeds and avocado. The bowl was garnished with pickled ginger and a wedge of lemon that I had no idea what to do with. I seasoned the whole bowl with a drizzle of soy sauce, and dug right in. My first bite was quite good—the avocado was nice and ripe, while the fish was well-seasoned and surprisingly spicy. The rice tied all of the flavors together and fooled my taste buds into thinking it was actually eating sushi. Score! However, my second bite was a completely different story. Two words: Frozen. Fish. I brought my partially eaten bowl to the front counter and reported the frigid news. The cashier’s response was pretty funny, “it’s only a little frozen,” he said. My Spicy Tuna Bowl was replaced with another, but I couldn’t shake the fact that I was eating fish that was once frozen. Ignorance is bliss when it comes to food preparation. Food critic Frank Bruni wrote about affordable sushi options in New York City a few weeks back in the Times, including a nod for Kanoyama. I’ll keep my eyes peeled for similarly good deals in my corner of Pasadena. Mako Bowl just ain’t cutting it. Chances are that the sushi eaten elsewhere is also frozen. “But Shin Tsujimura, the sushi chef at Nobu, closer to Wall Street, said he froze his own tuna. ”Even I cannot tell the difference between fresh and frozen in a blind test,” he said. Even Masa Takayama, whose sushi temple Masa, in the Time Warner Center, charges a minimum of $300 to worship, said he used frozen tuna when fresh is unavailable. Many sushi bars, in Japan and elsewhere, routinely use frozen fish when fresh is unavailable or more expensive than the market will bear. User – Fascinating! I’m comfortable with eating fish that was once frozen, but not fish that’s still frozen. That one icy bite just killed it for me. Thanks for chiming in. Good luck with finding a job, you will find something awesome I’m quite sure =) you know what, I am seriously addicted to your blog!! Yeah, frozen fish is no good. I’ve heard that all sushi-grade fish must be flash frozen to kill any parasites that may be in the meat. I would recommend checking out the Bristol Farms in Pasadena. They have a sushi section next to their seafood area. Depending on the time of day, there may be someone tending it than can make something for you by request from what I hear. But what they have ready made is really decent. They have a spicy salmon bowl and spicy tuna bowl for roughly the same price…possibly a tad cheaper. Very tasty. Best ready made grocery store rolls that include California rolls made with real crab but will make it on the pricier side. Hmmm…eating fish that’s still frozen doesn’t sound that appetizing to me. Go Go Sushi in Pasadena (corner of Colorado and Roosevelt) has pretty decent sushi. They have $2 menu too. When I want sushi, though, I go to Midori. 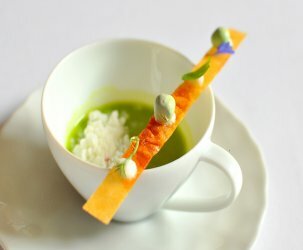 Midori has several locations but I typically go to the location in Studio City. For $25 per person, you get all the sushi you can stomach. Don’t let the all-you-can-eat moniker fools you though, they actually have good stuff! It really is a steal for the price. 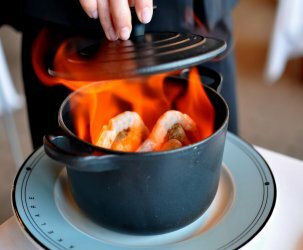 Mish – Carelessness in the kitchen is a big big turn off! And a addiction to Gastronomy is “perfectly normal, perfectly healthy,” in the words of Dr. Drew (addiction medicine specialist). You’re gonna dig Pasadena! I hope you visit in time for the Rose Parade. Aariq – I’m cool with freezing fish, but what really bothers me is the practice of “coloring” tuna and salmon to keep it looking fresh. Ick. Sarah – Thank you for the Bristol Farms tip. I’ve actually eaten sushi at the Bristol Farms in SF—their sushi really is terrific. I think I had the inari. 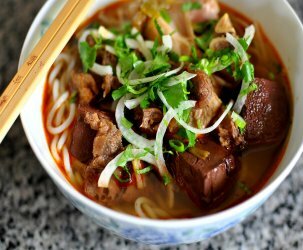 Anh – You’re full of tasty ideas. I will add it to the GROWING list. Thanks! William – Did someone say $2 sushi? NICE! And I LOVE All U Can Eat Sushi. I used to go quite often in Philly at Ajia. I will add Midori to my list and report back. Grazie! NHU! Me, you, Banbu. Next time you’re in SD. omg, europane is in that same little complex, on the ground level. you must go if you haven’t yet and get the macadamia nut tart! I’m with you and am not a big fan of costco sashimi. I’ve also heard that previously frozen is the norm here and is actually good for killing parasites… but I wouldn’t want to bite into frozen fish either – yuck. Sounds like you’ll have tons of good eating options in your new neighborhood! There’s a Mitsuwa right off of Las Tunas in San Gabriel. However, it’s much smaller than the Mitsuwa complex in Torrance. 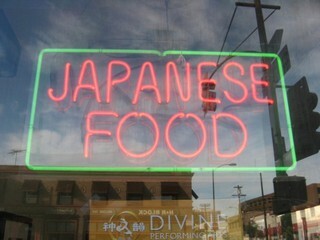 Then again, have you ventured to Little Tokyo, yet? There’s a membership-only supermarket called Marukai. You can get a 1-month membership for about $2. That’s what it was when I went there last. Fun place to go and grab sushi fixings and other Japanese food/goods.